Prototypes are an extension mechanism that lets authors define their own customizable nodes, improving reusability and sharing of cool content. By declaring prototype designs and then creating one or more instances, you can create new node types that encapsulate Shapes, Sensors, Interpolators, Scripts and anything else. This technique creates new high-level nodes such as robots, menus, new shapes, etc. A PROTO statement declares a new node type (a prototype) with a name (the new node type name) along with fields and events (the interfaces to the prototype). Once defined, a prototyped node can be used like any other node. Figure 31 1 Wall Color Prototype Definition and use of a WallColor node type. Figure 31 2 Material Prototypes Library An external file containing a material library with the WallColor-node-type definition. Figure 31 3 Material External Prototypes A world that uses an externally declared node type. Figure 31 4 Wood Appearance Prototypes Library An external file containing an appearance library with wood appearances. Figure 31 5 Wood Appearance External Prototypes Two wood blocks using appearance-node types from an external appearance library file. Note modification of second prototype using a TextureTransform node parameter. Figure 31 6 Donut Prototype A donut (torus) node prototype. Also see Figures 30.5 and 31.7 for comparison. Figure 31 7 Donut External Prototype A donut shape built using prototypes: the Donut geometry node and the LightOak appearance node. Also see Figures 30.5 and 31.6 for comparison. Figure 31 9 Spin Group Prototype The SpinGroup prototype is used to automatically spin a group of three long rectangular boxes. 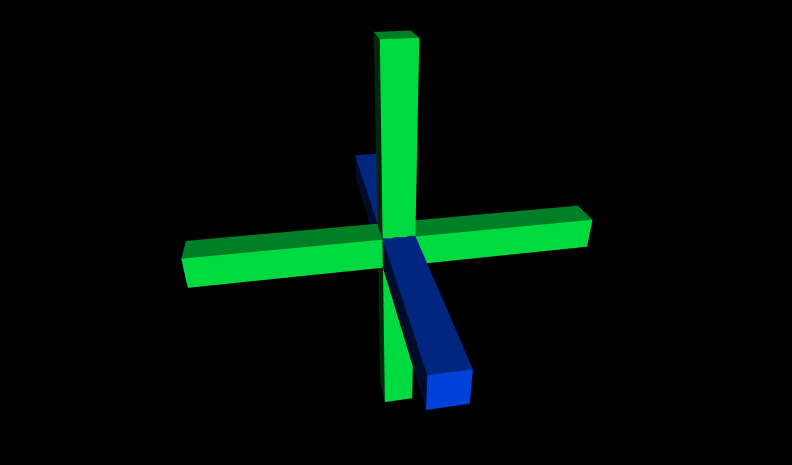 Click on blue crossbar to activate second SpinGroup.